The first question when a cult movie is remade is did the new one live up to the stature of the classic? There will always be two sides - one comparing it with the earlier movie and the other looking at it with a fresh perspective. We can try to explore both. Agneepath (2012) produced by the same Dharma productions (Karan Johar) and directed by debutant Karan Malhotra (who has earlier assisted the best of directors in making films like Lakshya, Pukar and Jodhaa Akbar) makes all the right moves. It has the best of ingredients including actors such as Hrithik Roshan, Sanjay Dutt, Rishi Kapoor, Om Puri, Priyanka Chopra, Zarina Wahab, Sachin Khedekar. Then there’s cinematography by Kiran Deohans (Jodhaa Akbar, Kabhi Khushi Kabhi Gham). The story itself gets revamped by the director and the dialogues are written by ever talented Piyush Mishra. This is a team to envy for sure. The movie is quintessential bollywood story of revenge and vengeance. It’s a story of simmering anger that turns an innocent victim into a powerful hero - a nemesis for the villain; a plot that has been often explored by most of the movies of the 70s and 80s. In the fictional town of Mandwa, a true Gandhian teacher Dinanath Chahuhan (Chetan Pandit) is accused, humiliated and killed for getting in the way of the ruthless evil Kancha (Sanjay Dutt). The Master's wife takes their son and yet-to-be-born daughter to Mumbai. The weak young Vijay (Arush Bhiwandiwala) wants nothing but revenge. His path to get his revenge is what the film is all about. Vijay grows up to become an intelligent, well trained gangster under the auspice of Rauf Lala (a character brilliantly essayed by Rishi Kapoor). Vijay makes his way up by strength and by deceit to reach his destination - Mandwa, which is now ruled by Kancha. Along the way there is a constant support system for Vijay in form of Kaali (Priyanka Chopra) and a 70s style don brother-meets-sister sequences. Without making any comparisons to the original film, the remake still feels slightly flat. It has either bad characters or good characters, which removes the depth from their roles. Like Dong of Dongrila (From Tehelka - whose poster is seen in one of the sets used for Agneepath), Kancha too is loudly dark. He is a villain with no facial hair, not even the brows and one who exudes power from his appearance. Then there is a good boy Vijay whose simmering anger at the heart of his life makes him grow. One who is in the bad world too, but is a Robin Hood style of baddie. One who runs a charitable trust from the money he earns in the cocaine trade (haven’t we heard this earlier). And then there is a character of Rauf Lala - a drug smuggler and a pimp; a new dark addition to the story that created its place for the lack of Krishnan Iyer M.A. He is emotionless in what he calls his business. If we look closely, the story of Rauf Lala is exactly the same story of Vijay - Revenge and Vengeance for the death of their loved one. Only difference is the flat characterization - Vijay being "good" at the beginning and Lala always “bad”. And then there is the "good" cop Gaitonde (played by Om Puri) who reminds Vijay of his father. There are a lot of other characters in the movie, almost irrelevant to the story - whether it be that of Kaali or that of Vijay's mother or even his sister. Subplots of the minister (played by Sachin Khedekar) and Lala’s sons (Ashish Tandon and Deven Bhojani) don’t add a lot of value to the story. Even if all these subplots are removed from the movie, the new Agneepath will still stand on its own core and hence they feel irrelevant. 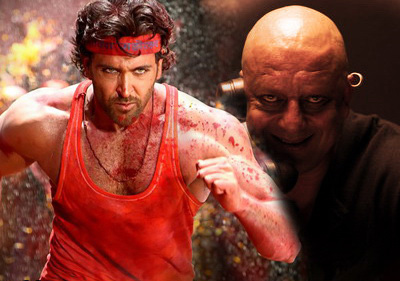 If we compare the new Agneepath with the earlier one which looks inevitable, there are many things that are missing in this version. Firstly, the very heart of the earlier role of Vijay essayed by Amitabh Bachhan was his loneliness. Vijay of 90s was alone even while he talked to his mother, his sister or his lover. He was alone when he faced the baddies and took bullet shots on his body and he was alone when he sees Gaitonde and gives a monologue on how the powerful nabs the weak in this world. That aloofness and depth in depiction of it created the character of Vijay Dinanath Chahuhan that we still remember. It is completely missing in the new one as you see the new Vijay smiling and dancing with Kaali on “Gunguna” or see him pray to Lord Ganesha. The older version of Vijay cared for his people - the supressed, so that no new Vijay is born out of exploitation. The newer version runs an ambulance service in his sister's name instead. So the new Agneepath just misses the point. Apart from Vijay another character that made the older flick work was that of Suhasini Dinanath Chauhan - the mother played by Rohini Hattangini. The round framed specs of the Gandhian were not the only thing that reflected her husband's image in her. She was a strong character, who stood up against Vijay and held the ideology of family high till the time her son’s death in her arms. The new mother is merely turned into a weak character of 90s and does what mothers are expected to do - sob, cry, shout, and ask for help. The place where the movie matches the earlier one and in fact outdoes it is cinematography. Kiran Deohans has created the mood and place of the new Agneepath and gets two thumbs up. Whether it be the dark Mandwa of Kancha in the last sequence or the "Bargad ka Ped" silhouettes of the Chauhan father and son, every frame is created with special effort. Later when the movie switches to conversational mode, the wider perspective and shadow-light play of earlier Agneepath could not be recreated here. Editing is bad in both the movies. Compare the last scene of both the movies and you can see the difference - A dying Vijay played by Amitabh Bachhan was talking about his sister, about electricity in the village, about the fact that he has undone his bad deeds of life, while the new one just hams around his revenge. Dialogues written by Kader Khan in the earlier version were much more impactful than Piyush Mishra's version. Sanjay Dutt looks formidable as Kancha. Only he could have carried off the heavy handed dialogues written for the character. Hrithik Roshan looks earnest in the role of Vijay and gives a good performance. Priyanka Chopra is likeable but with poor characterization. Zarina Wahab, Deven Bhojani, Rajesh Tandon get badly written characters and they play it down further. Two people live it up to the roles of earlier classic, completely and pay true homage to those character - Om Puri whose good cop act is as good as Vikram Gokhale's and another one by Arush Bhiwandi Wala. Arush I feel had as difficult a task of matching up with Master Manjunath (who also did awesome work as Swami in Malgudi days) as Hrithik Roshan had. It’s entirely for this young actor that the first half hour is gripping and enjoyable. Later the movie almost plays like one from 90s. Kanika Tiwari as the little sister Shiksha, could have been given more dialogues, same with Chetan Pandit who looks good as Master Dinanath, but it’s difficult to match Alok Nath in any fatherly role. Katrina Kaif in the item number swings on from looking ravishing to vulgar at different points. But the movie belongs to Rauf Lala -Rishi Kapoor. Only negative character I remember him playing was in Bol Radha Bol but that wasn’t so dark. He surprises with a power packed performance as Rauf Lala. He looks mightier and scarier than both Kancha and Vijay by mere acting - even while the other two are physically superior build. The way he delivers the dialogue even in an unnecessary forced scene of his death is absolutely awesome. His acting makes the movie better. Neither Hrithik nor Sanjay Dutt matches him in screen presence. Songs of the new Agneepath are well composed by Ajay Atul especially “Chikni Chameli”. The background score was a little loud but did go well with the mood of the film. Manish Malhotra's costumes don’t give the same style to Vijay's character like the white suits of Amitabh Bachhan brought. But the underlying reason why the movie doesn’t work is because of the writers - Piyush Mishra, who did a fabulous work with Gulaal and who undoubtedly is one of the creative geniuses of the industry comes up with some ridiculous and simple dialogues but at least shows his flair with a character like Rauf Lala who gets some meaty dialogues. The story is full of gaps and unanswerable questions and could have been much better written by Karan Malhotra. Coming back to where we started. Does the remake live up to the stature of the classic? In my opinion it’s a clear NO. If we look at it as a standalone film, the movie feels out-dated. Though it’s better than the many hits that we saw in 2011, it still doesn’t work. There were lots of things that could have been improved over the earlier Agneepath but just matching up the steps turned out a little too heavy for the first time director. Consequently, the movie turns out to be an ordinary bollywood masala potboiler.